Set back one section from the road, this newly renovated batch offers a quiet beach side retreat. 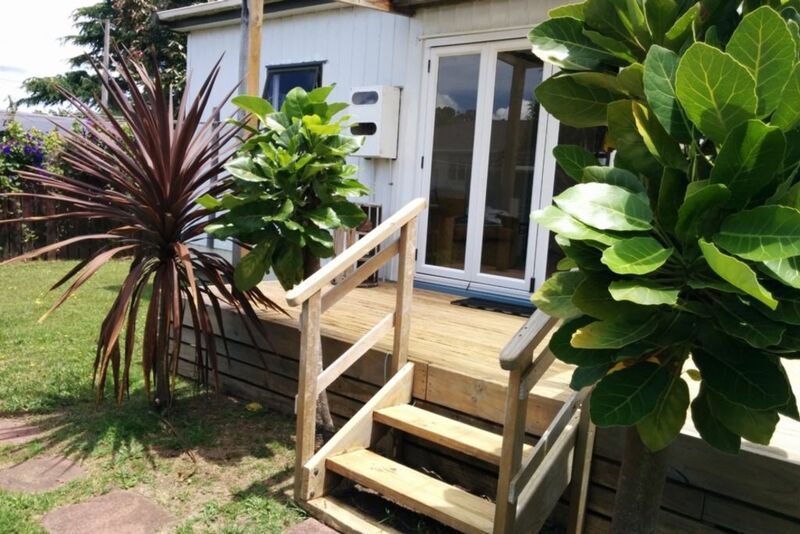 Just a 5 minute walk to the township of Whitianga with its abundance of cafes and restaurants and 10 minutes walk to the beach, ferry and banana boat, you'll find plenty to do, or simply stay in and relax with an on site massage (bookings required). If your feeling energetic, walk across the road to the free tennis courts and sports ground. Blow up bed and extra linen on request. We loved our stay! The Bach was in a perfect location, easy walk to town yet very quiet and private. Would definitely return or recommend to friends in the area. Great spot close to everything, totally recommend! This place is a great find, exactly as outlined in the description. Recommend to everyone! The Bach was in a very quiet spot just a few hundred meters from all the main amenities in the town. It was clean, modern and very comfortable. Great clean and tidy place. Highly recommend! We had a lovely stay. The place had everything we needed and was in great condition. Really easy dealing with the owners coming and going. Would love stay again. Highly recommend. Lovely private space in a good location close to everything. Modern and tastefully appointed. Hosts very nice and accommodating.